Hey, everyone! I figured I'd give you all an update on where we are now, where we're going, and how we're getting there. Presently out in the wild are four pre-constructed decks to get people up and running with playing the game, five reprint bundles to make important and previously out-of-print cards accessible to both older and newer players, as well as an expansion bundle of entirely new cards to bolster clans that needed help and to inject some new blood into the game. We've also launched the Custom Card Creator for VTES on Drivethrucards.com to allow you to try out your own card ideas. Arriving in April is a second printing of the Sabbat-themed pre-constructed decks. Coming up very soon afterward are a handful of promo cards in support of some upcoming major events. In the summer we'll celebrate the 25th anniversary of VTES with a special reprint bundle - we'll be digging very deep into the vaults for that one. Somewhere in the middle of all of that we'll be offering new demo decks to retailers so they can help us embrace new players. 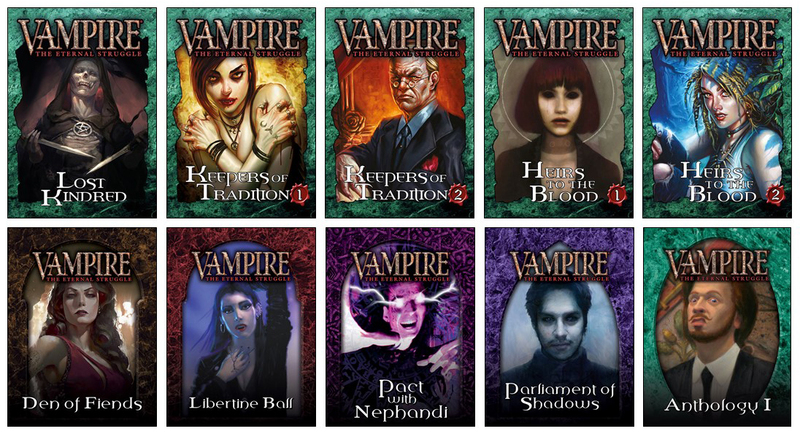 Following that, towards the end of 2019, we'll release a Camarilla-themed boxed set which will include everything needed to play VTES: pre-constructed decks, blood counters, an Edge marker, and an updated rulebook. What else is down the road? In the planning stages are pre-constructed decks for Anarchs as well as a follow-up expansion in support of the Camarilla box set. We're also in serious discussions about translating VTES into languages other than English – we'll have more information on that when we're prepared to announce it. We haven't met our original goals for making more reprints available, so we'll be pursuing that as well. Feedback for the Sabbat pre-constructed decks has been overwhelmingly positive and I expect we'll continue to pursue pre-constructed decks as a vehicle for reprints. I don't expect we'll return to the Sabbat until perhaps late 2020. We have a lot to work on for Camarilla and Anarchs for the next year or so, and there's still material to be developed for the Sabbat in V5 that we're waiting on so that the course is made clear. 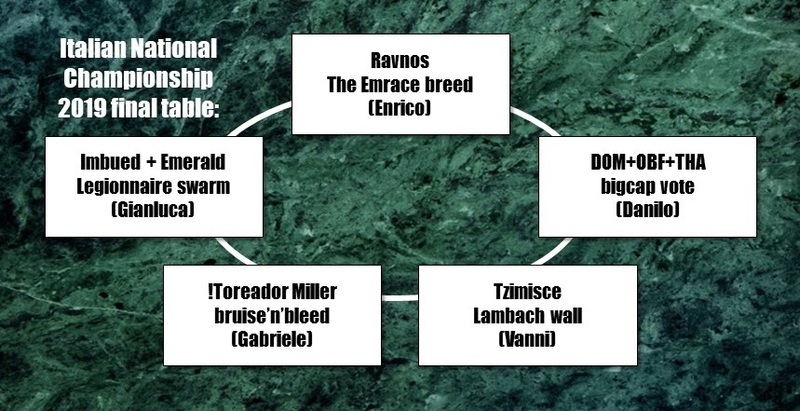 We'd love to work on Bloodlines clans again, particularly the ones we didn't cover in Lost Kindred, but those clans are on an indefinite hold until we get the green light from White Wolf for their development. The Laibon clans aren't on the horizon at this time. VTES has always provided snapshots of the present state of the World of Darkness and it has always permitted you to mix both old and new elements in your games. 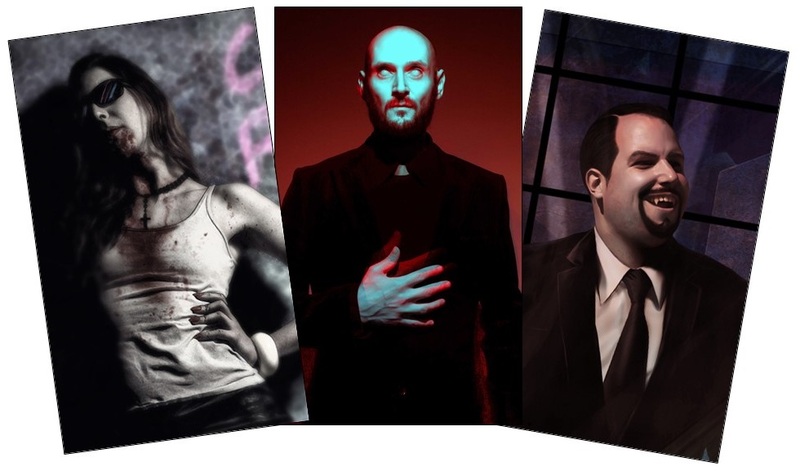 We will continue that tradition in earnest and we're working with White Wolf to incorporate the developments of Fifth Edition Vampire: the Masquerade into VTES. We're giving the rulebook an overhaul, but it will remain the game as you have played it, just with a proper foundation for the game's mechanics. There are some changes coming, but those changes won't invalidate the cards you own and they'll help us grow and develop the game further. All of this will be tested and improved with the help of the game's community. Many thanks to all of you for your continued support of the game and for your cameraderie! The European Championship is this year held in Paris, France on August 16-18 (with a “Week of Nightmares” of other events). The official site is now up, with information about venue, schedule, registration, registered players and a nice “History of VTES” slideshow. Check it out and register for the EC! No qualification required for this year's Day 1 tournament. Note that the booster draft tournament on Friday is limited to 40 players, so first come, first served for that one! 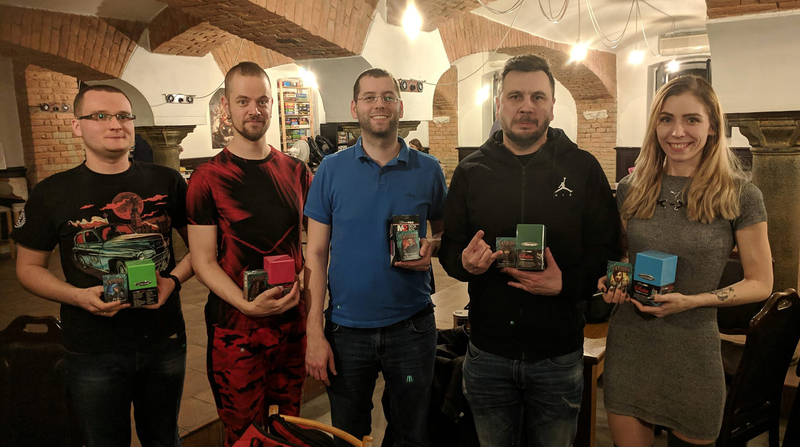 42 players turned up for this year's Czech VEG tournament in Brno March 16. Daniel: 2 – Champion because of first seed, congratulations Daniel! Thanks to all attendants, the organizers and our sponsor Ultra Pro. 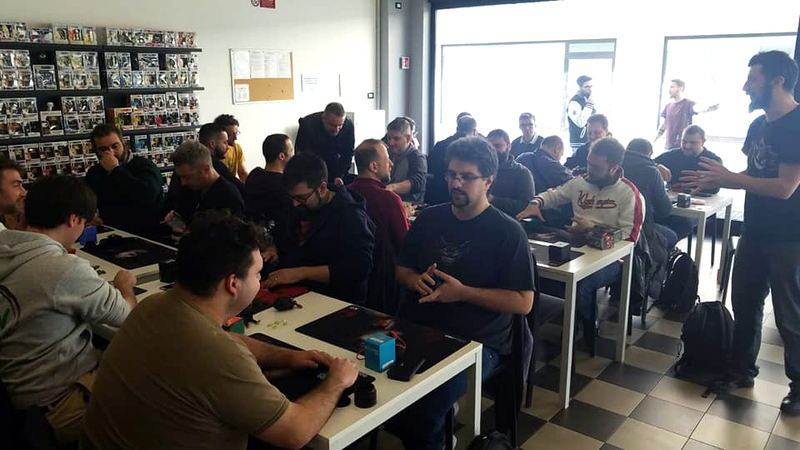 26 Methuselahs played the 2019 Italian National Championship in Brescia March 16. 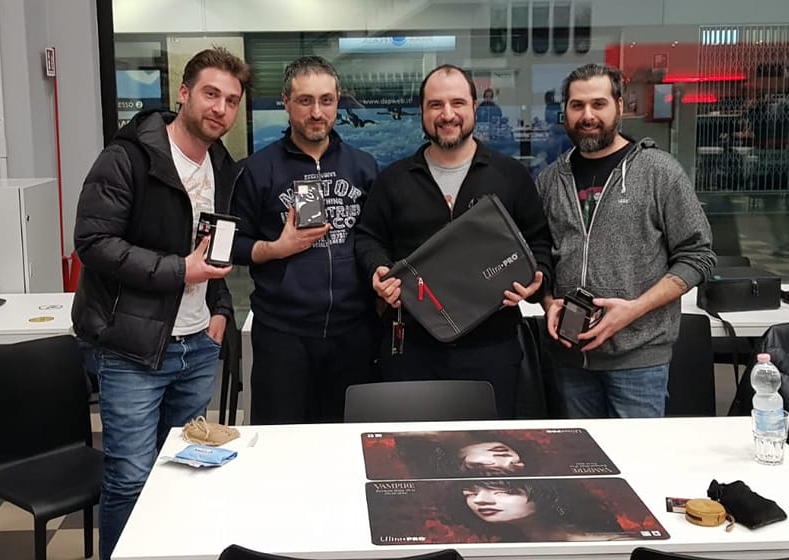 Enrico: 1.5 – Champion because of first seed, congratulations Enrico! Enrico with the big prize. Thanks to organizers, attendants and our sponsor Ultra Pro. Q: What do the cards cost? A: $0.50 each. There is a minimum 10-card order. Q: Can I upload my own images to use in Card Creator? A: Yes. To have them printed you need to own the rights for those images yourself, or use images not under any copyright protection. Q: Can I order cards created by other customers? A: Yes, all cards that are visible to you in the webshop can be purchased, as each customer that uploads, as the rights to those images have been cleared by the user agreement. Making a custom-created card public is an option at the end of the card creation process. Q: Can I use other art that is the property of White Wolf? A: No, not for printing. The only White Wolf art that you can print on a card created with Card Creator is the art already on the site, uploaded by White Wolf. Q: Can I name a card what I want? A: Yes, as long as the name is not protected by trademark (for example company names, brand names, etc.) We also ask you to apply common sense about what can be offensive. Q: Are the cards I create in Card Creator legal in VEKN sanctioned VTES tournaments? A: No. Each cards says “Not for legal play”. Q: Does this mean proxies are no longer legal? 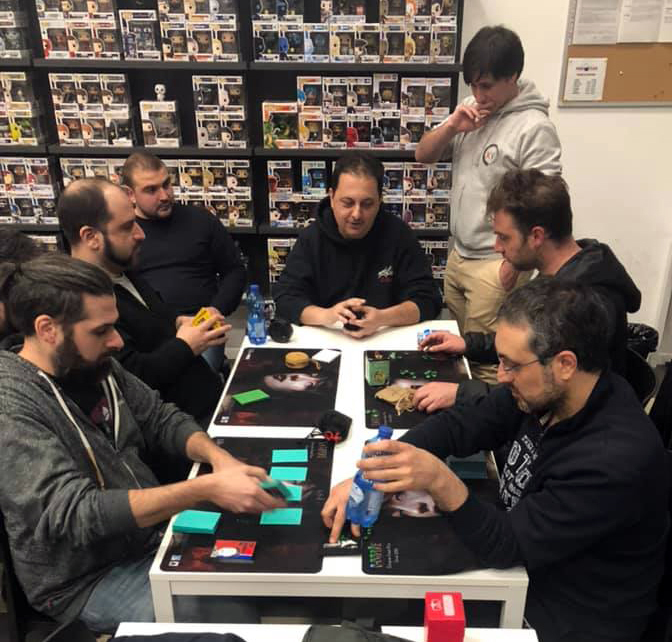 A: No, the existance of Card Creator does not affect the legality of printed proxies – that is covered in section 4.5 of the Tournament Rules. Q: Is there any way to input artist credit? A: Not at this point, but we are looking into that. You can always make the artist sign his/her name on the actual image. Q: Why does it cost so much to ship from Drivethrucards to my country? A: The cards are printed in the USA. All shipping costs are simply the cost of packaging and what USPS charges for shipping. Drivethrucards's system polls USPS servers in real time to get the shipping costs that are just passed through, without markup. Drivethrucards is actively seeking a European-based printing partner; when they find the right partner, shipping costs will decrease at that time. 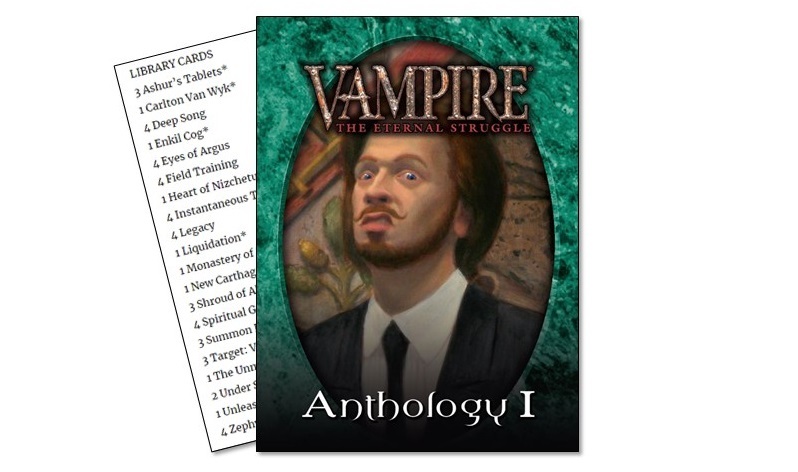 • For clarity: the “March surprise” mentioned in last month's newsletter was the fantastic Vampire: The Eternal Struggle Card Creator. Please take it for a spin! 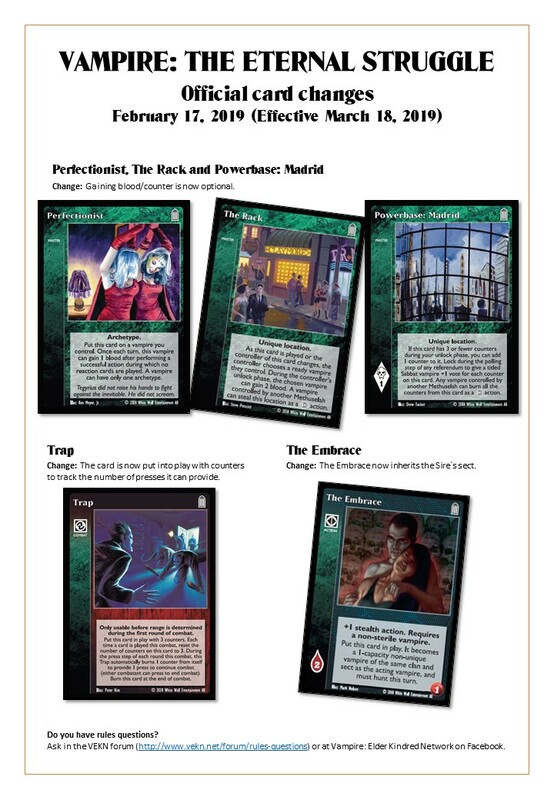 • Design Guidelines for the VTES Card Creator were published. Remember, these are just guidelines – designing balanced crypt cards for this game is by no way easy, especially if you consider the group rule. • The four Sabbat pre-constructed decks and Anthology I have been reprinted and should be in stores again in the first week of April. • For more information about current projects and the future, see Ben Peal's product update above. The first round of playtesting of the decks for the Camarilla-themed boxed set he mentions has just begun! Do you have opinions or questions for Black Chantry? Start a topic on the VEKN forum, or contact the company by e-mail, Facebook or Twitter. Many fans of the World of Darkness were waiting, and last week Paradox Interactive and White Wolf Entertainment finally announced that a sequel to the very popular computer RPG “Bloodlines” is in the pipeline. Created in an act of vampire insurrection, your existence ignites a blood war among the vampire factions who run Seattle. To survive, you’ll choose a clan and enter into uneasy alliances with the competing factions in a world which will react to every choice you make. Unleash your supernatural powers against your prey, but be mindful of your surroundings at all times or run the risk of breaking the Masquerade – the absolute law of secrecy that keeps Vampire society hidden from humanity. 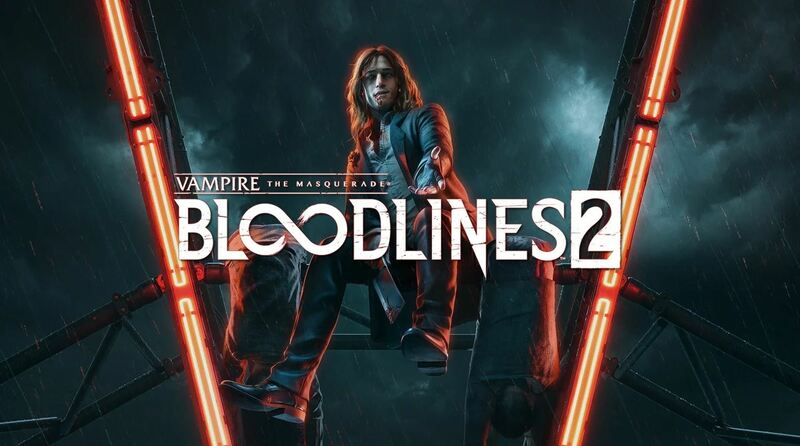 “Bloodlines 2” is developed by Hardsuit Labs and will be ready for you to sink your teeth in by first quarter 2020 (preorders already possible). For more information on upcoming events see the V:EKN Event Calendar. 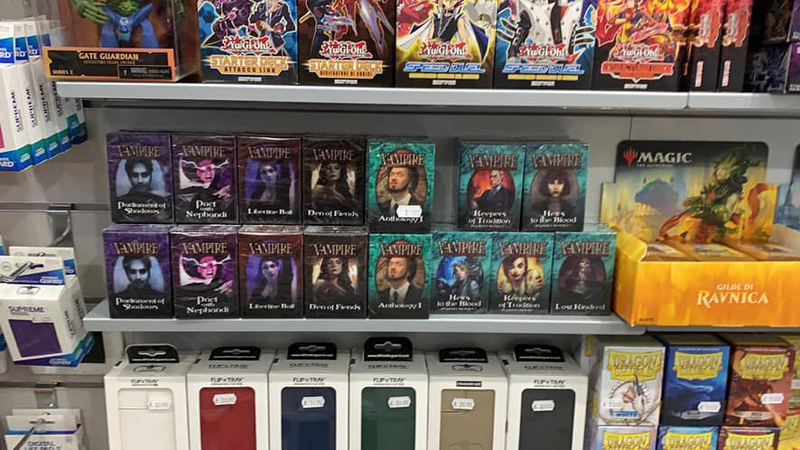 It is February 2019, and for the first time since February 2010, a set of new starter decks is available for purchase in game stores in Santiago, Sydney, Johannesburg, Milan, Helsinki – throughout the world! A beautiful sight! From Bologna, Italy, thanks for the photo, Emma. There have been sealed deck release events in many of these places, actually too many to keep track of, because not many of them are put into the VEKN event calendar. But many games have been played, and many players had great fun. 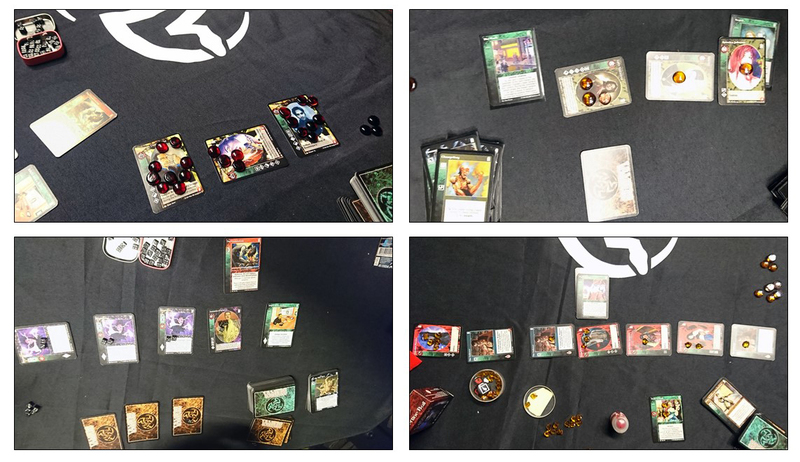 Snapshots from the Stockholm release tournament, won by Kim Nilsson playing the Toreador antitribu Libertine Ball deck. All this feels like a great reward for many of us that have worked as volunteers for the last nine years, struggling to keep the Eternal Struggle eternal. Thanks for all such efforts, and thanks to you that turn up to play VTES events! Click to download pdf version. • Perfectionist: Gaining blood is now optional. • Trap: Is now put into play with counters to track the number of presses it can provide. • Powerbase: Madrid: Adding the counter is now optional. • Rack, The: Adding the blood is now optional. • Embrace, The: Inherits the Sire's sect. The changes are effective in tournament play on March 18th, 2019. Do you have rules questions? Ask in the VEKN forum or at Vampire: Elder Kindred Network on Facebook. 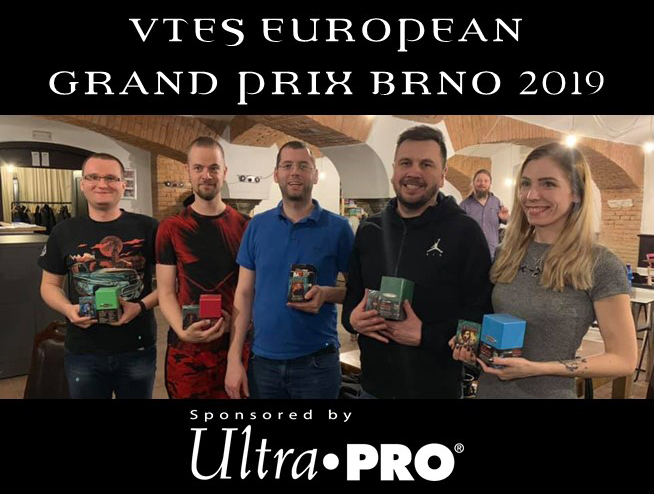 This month the Czech VTES community welcomes you to the next VEG tournament. The venue is Black Oil, Kotlářská 51a in Brno and games start at 15:00. Remember that all VEG players this year get the awesome playmat depictured above, courtesy of Ultrapro. More information at the Facebook event VEG Czech Republic and in the VEKN event calendar. • As mentioned above, February 16th was the big day for Black Chantry this month, with five new VTES products both on store shelves all over the world and available on Drivethrucards.com. • Sadly, there also had to be an announcement on a production error. A serious stain on the protocol, but hopefully forgiveable in the long run. All future printings, including the new print runs of the February releases, will have the correct corners. 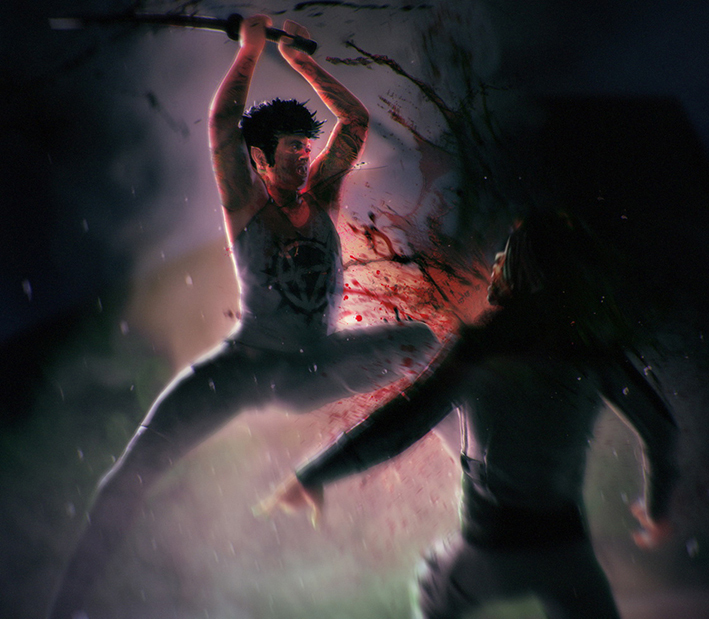 • VTES designers Ben Peal and Mike Nudd have just completed a first draft of the next cards for playtesters to test. It is very exciting stuff! Do you and your playgroup want to playtest? Send an application to playtest coordinator Darby Keeney as described in this post. • A very special surprise product will be announced in March. Watch out for that! Hello Javier. You have made VTES art for a number of sets now, but I´m not sure our players know a lot about you. What is your background? - Firstly, I want to introduce myself. I was born in Ávila, Spain, in 1983, but I have always lived in Madrid. Since I was a child, I have always loved manga, anime, computers and video games. I studied a Computer Science degree but, after attending an art course of design in Madrid, I began my career as a concept artist. Nowadays I am a freelancer concept artist and illustrator working in many interesting projects. I have always loved drawing and I have considered myself a very creative and inspired person, although I hadn't developed any special interest in being an artist until I attended an art course. From that moment I started to learn the fundamentals to level-up my drawing and painting skills. Finally, and with the boom of the Internet, I was able to get into the industry, by contacting some clients and starting my career as a concept artist. What kind of motives do you generally prefer? - I really like sci-fi and dark themes. For that reason, I find VTES art very close to my preferences on colour palette and mood choices. Movies like “Blade Runner”, “Ghost in the Shell” and “Akira” are my greatest inspirations. What artistical techniques do you prefer? Is it all digital? - Yes, basically it is all digital nowadays. However, I am still using the paper and pen for quick sketches, rough concepts or ideas. Most of your art seem to have elements of photos or are done in a photo-realistic style. Do you work with models and photos? - I usually start by drawing some thumbnails to find out some cool shapes and compositions. In this early step, I am not looking at any references or putting any efforts into details. After I have decided the final thumbnail to proceed with, I start blocking all the colours and basic shapes while looking for some references at the same time. Next, I start fixing some values, perspective issues, lighting, etc. Sometimes, I use 3D tools to help me out on this step, since it is a 50% of the illustration. If the perspective or light are badly implemented, the final image will look weird. Finally, I start adding the last details with the use of some textures and photos to make it more realistic and reinforce the overall composition. You have done VTES, but also other games and other places. What work are you most proud of so far? - I think VTES is one of my biggest contributions, at least it is the longest so far. I have seen my evolution over the period of time I have worked with VTES, and it is very clear my style has changed a lot. I have no best piece of art at all, I think all of them own a lot of sentiments and meanings to myself. Thanks for these answers Javier. Make sure to check out his site Javisart.com and follow him in various social media. And don´t miss our previous artist interviews, with Ken Meyer Jr, Carmen Cornet, Noora Hirvonen, Riccardo Fabiani, Heather Kreiter and Mark Kelly - many more will follow! WHAT ABOUT THE ANTHOLOGY 1 ART? Many are asking, so we better make this clear: Most art in the upcoming Anthology 1 set will be the original art, i.e. the art used for the card in the first printing, not the art produced for the Berlin Anthology printing. This has now been marked on the list at the Anthology 1 product page. This means the lucky persons who struggled to get hold of the Berlin sets are in possession of something special – Black Chantry will not reuse that art in the forseeable future, with the exception of the ten LARP-related cards produced for World of Darkness Berlin (Styles Margs, The Line, etc.) – these will be reprinted soon. Another question that pops up frequently for VEKN and Black Chantry officials are if the “pdf sets” produced by the VEKN 2013-2016 are legal for tournament play. The answer is: YES, they are legal until further notice. The pdf-files are found at Official Expansion sets page at VEKN.net, so go ahead, print and play! 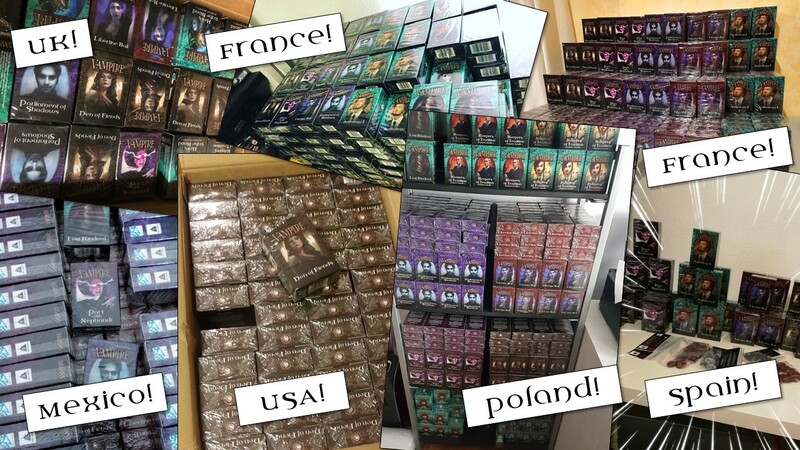 • The first US distributor for the European printed cards has been found: KGS Cards. Print-on-demand will continue on Drivethrucards, now also testing “European style” tuckboxes. • January was spoiler month for the upcoming Sabbat pre-constructed decks. Now everything has been spoiled - check out each product page for all card and art previews. • The release date for the Sabbat pre-cons AND Anthology 1 is nailed: From February 16th you will find these products in stores who made their orders on time, and on Drivethrucards.com. • A revised pdf rulesbook – in English and Spanish – is available on Blackchantry.com/rulebook. These are the latest official rules, and the version that will be tested and used as a base for the improved, illustrated and beginner-friendly variant that will appear later this year. • The site Blackchanty.com has received a minor face lift, but will still be kept rather simple. A more advanced site with all kinds of fantastic content is in the pipeline, but for now getting more VTES cards into the hands of players has priority. Mark Kelly immediatelly became a fan favourite when he started illustrating VTES in 2014. His realistic but yet horrific style has proven perfect for eye-catching portraits on VTES crypt cards. We caught Mark in a blur of hardware failures, deadlines and termites (! ), and he had the kindness to handle our usual arsenal of artist questions. Are you educated or self-taught? - In my younger years I was always being creative and it started mostly when I got a copy of the second edition of Warhammer Fantasy Battle with The Tragedy of McDeath when I was about 7 years old. I was always painting, drawing, sculpting and making things in general. After leaving school I started on the path to becoming an architect but I dropped out after two years and left sunny Scotland for Amsterdam. The next 10 years or so are a bit of blur... I spent mostly partying and playing video games. I eventually quit that lifestyle completely and threw all my energy into creative endeavors. That's when I discovered my love for photography. Initially I was drawn to more abstract photography and landscapes but I soon moved over to portraiture, which is my true passion. All aspects of my creative skill set are self-taught. From painting, illustration, photography, graphic design etc. I tend to jump in at the deep end and figure things out under pressure. What kind of assignments do you prefer? - Honestly, I'm all over the place really. 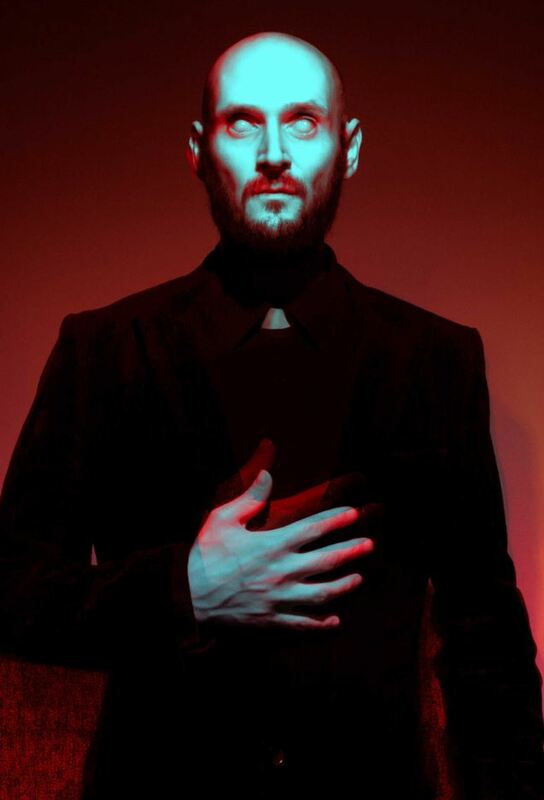 I'm drawn as much to the creepy and macabre as I am to vibrant neon noir cassette futurism. What I prefer most in an assignment is being allowed the freedom to create, within the boundaries of the project of course. I am drawn more to the conceptual interpretation and less so to the generic RPG illustrative approach. What techniques do you prefer? - I prefer working with digital media. Mixing photographic elements, light, digital paint and textures. Anything that's going to allow me to convey the artwork as I see it in my mind's eye. How do you work with models and photos? You have made lots of work for VTES and others – what are you most proud of? 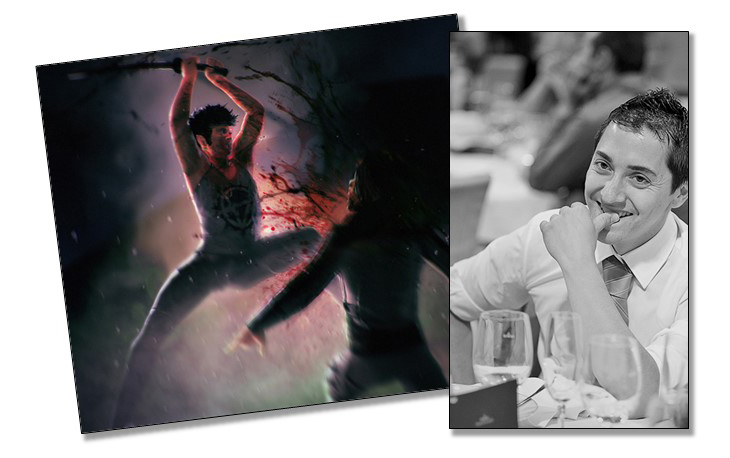 - My biggest creative achievement to date was for Mark Rein Hagen's I AM ZOMBIE RPG which was released a couple of years back. A huge project where I did all the artwork, layout, design and factory production management. A 288 page full colour book with bespoke spreads chock-full of artwork, 108 double-sided character cards with a unique portrait either side and the core rule book. Up until that point I'd never used any form of layout software let alone laid out a book, so it was a mammoth challenge that not only turned out to be a great education but a great product. 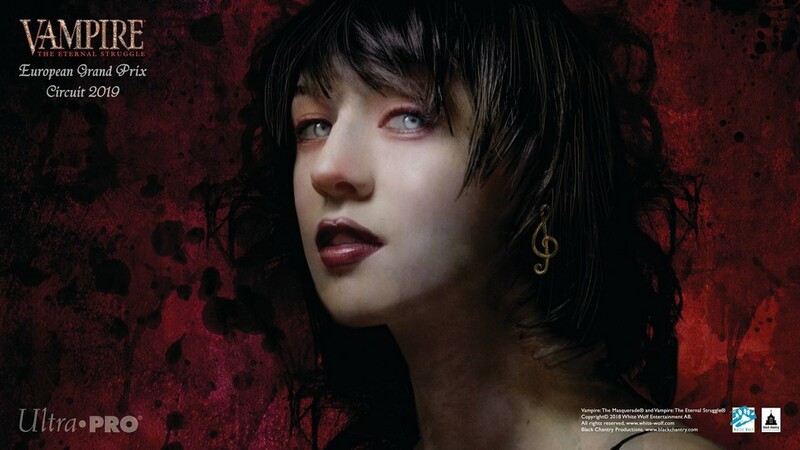 I was also pretty chuffed to get my work included in the new Vampire: The Masquerade Fifth Edition book. I did quite a few full pagers for that. What other work do you do these days? - Along with being the lead artist for Make Believe Games (MBG), I've been doing quite a bit of freelance work as both an art director and artist. I've recently started my own publishing company called Dirty Vortex where we'll be producing a range of RPGs and tabletop accessories such as dice sets and 3d terrain. One of our first projects is a collection of Art Deco inspired polyhedral dice called Deco Dice and great for any game set within the Jazz Age. It recently launched Kickstarter and funded within the first 24 hours so that was a fabulous way to start the year. Sets of 10 x D10s are available which are great for VtM and WoD. - We also have a range of indie RPGs in development that will be releasing in 2019. First up is Solemn Vale which is a folk horror roleplaying game set within an isolated village in the South West of England. It's being developed by Matthew Dawkins and has a bunch of great writing talent assigned. That'll be followed up by Endgame '85 which set in a world devastated by a recent nuclear war and is currently being written by the fabulous Brendan Carrion and Adam Sink from the Full Metal RPG Podcast. Last, but not least, we'll have The Sigma Syndrome where players take on the role of powerful psykers. We've yet to assign dev and writing on that. It's shaping up to be a solid year with many projects in the mix and as a huge VTES fan I hope to get a few more card illustrations done. Please, also read our previous artist interviews, with Ken Meyer Jr, Carmen Cornet, Noora Hirvonen, Riccardo Fabiani and Heather Kreiter - many more will follow! 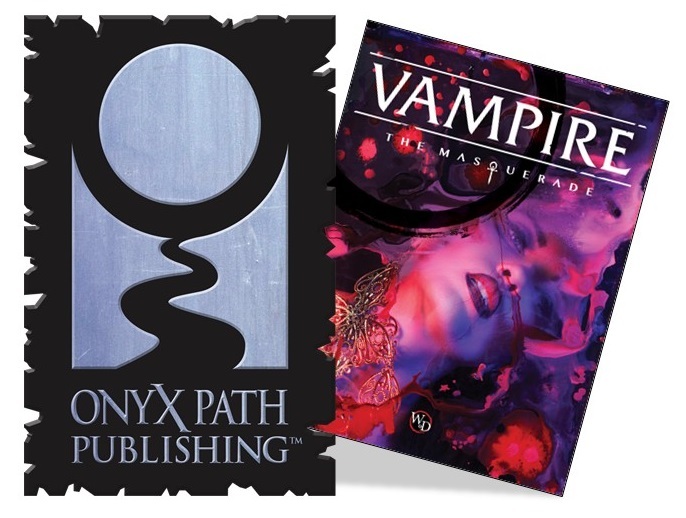 Onyx Path Publishing (which is doing Chicago By Night and The Fall of London for Vampire: The Masquerade Fifth Edition) recently revealed yet another exciting V5 product in their pipeline: Cults of the Blood Gods. Not many details are disclosed at this point, but the book is developed by Matthew Dawkins and has been described by Onyx Path CEO (and VTES artist) Richard Thomas as "a book detailing the Hecata including Clan Giovanni, the various religions that have sprung out of vampire culture like the Church of Caine, and much more!" 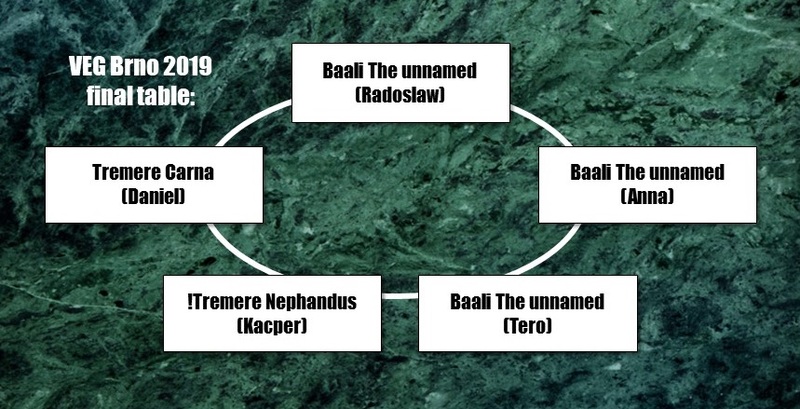 Hecata is the V5 catch all-name for the clans and bloodlines in the necromantic tradition; Giovanni, Harbingers of Skulls, Cappadocians and Samedi. We´ll see in the future what this means for VTES!